Water Resistant with Textile/Fabric Upper. Totally Lined to preserve feet warm in cold situations. Tough wearing outsole supplying superb durability and traction. Fitment provided with a five eyelet lacing technique. Unisex boot offered in a huge dimension range. Ideal Boot for all seasons. Grip grooves for outstanding traction. Inner materials TEXTILE. Upper material TEXTILE. Sole material PU. Water Resistant with Textile/Fabric Upper. Fully Lined to keep feet warm in cold conditions. Hard wearing outsole providing excellent durability and traction. Fitment provided with a five eyelet lacing system. 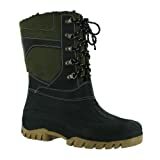 Unisex boot available in a vast size range.